Aldous ate the World: Are You Ready for Verdict 8: Oasis? 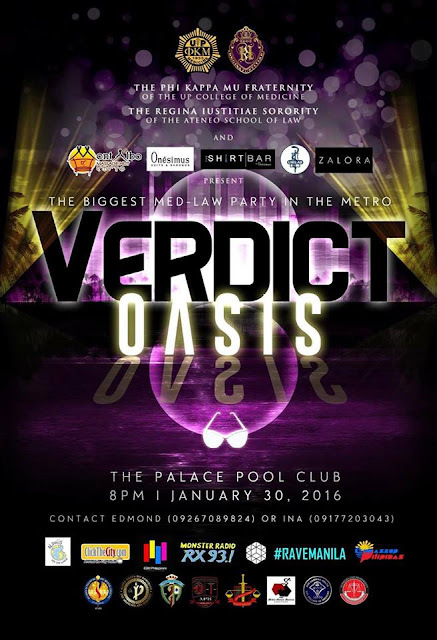 Aldous ate the World is a proud media partner of the biggest med-law party in the metro, Verdict 8: Oasis happening on January 30, 8 PM at the Palace Pool Club. There is a reason why I mark my January calendar every year for Verdict because it is an experience like no other. It is a combined effort from the Regina Iustitiae Sorority from the Ateneo Law School and the Phi Kappa Mu Fraternity from the UP College of Medicine. Regina Iustitae is a sorority that promotes women empowerment and independence in a male-dominated profession. They are celebrating their 10th anniversary this year and what better way to kick things off than with Verdict 8: Oasis. Lose yourself in the oasis as the event is open to anybody who wants to come and party with smart and beautiful people at the hottest club in the metro. Tickets are priced at only P450 each. For more information, contact Edmond at 09267089824 or Ina at 09177203043.